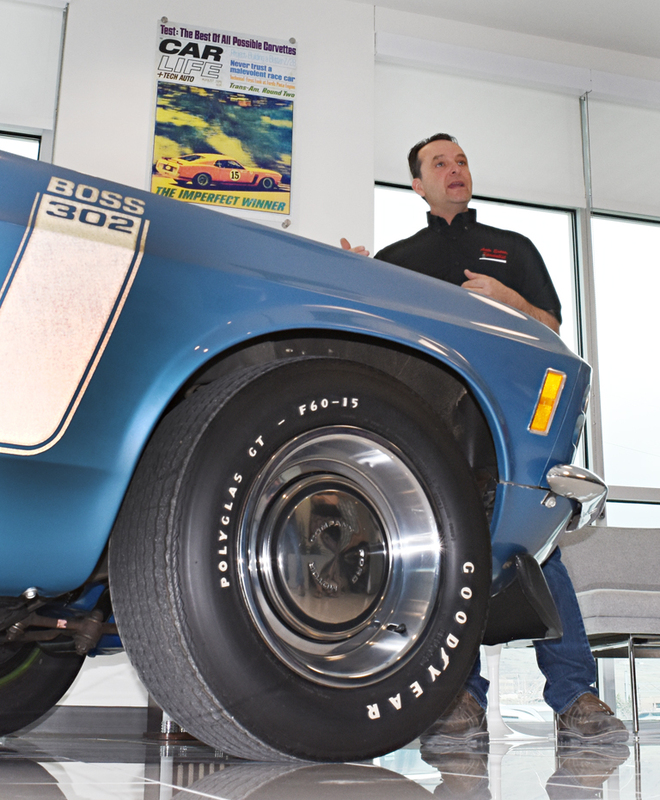 …..and how the stunning, all original, 16,000-mile and highly collectible 1970 Boss 302 we have on display at Hagerty in Golden this month still has the original wheels and tires that it came from the dealer with! A true ‘Timecapsule’. The car which is maintained by Gary Riley at Level One Restoration in Denver, is kindly on loan from owner and collector Wayne Schmeeckle. 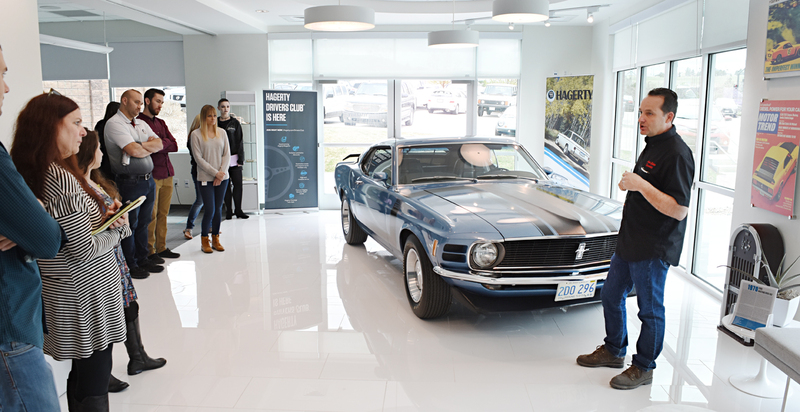 This week Auto-Archives are celebrating ‘Mustang Month’ and more… specifically the 50th Anniversary of the Iconic Boss 302. The Ford Mustang Boss 302 was the high-performance variant of the Ford Mustang announced by Ford 50 years ago in 1969. Designed to rival the Chevrolet Camaro Z28, it was produced alongside its more powerful sibling the Boss 429 in both 1969 and 1970. Like the Z28, the Boss 302 was built as a Trans Am road-racing qualifier, and at its heart was the Ford 302 cubic-inch V8, treated to the high-performance, big-port cylinder heads being readied for the famous Cleveland 351. The solid-lifter small-block V8 in the ‘Boss’ used the biggest carb employed by Ford, a Holley four-barrel, and was officially ‘underrated’ at the same 290bhp as the Z28’s 302 motor. A Hurst-shifted four speed manual transmission was standard; 3.91:1 and Detroit Locker 4.30:1 cogs were optional. Underneath were racing-inspired suspension modifications, including larger sway bars, heavier duty spindles, reinforced shock towers and power front discs. 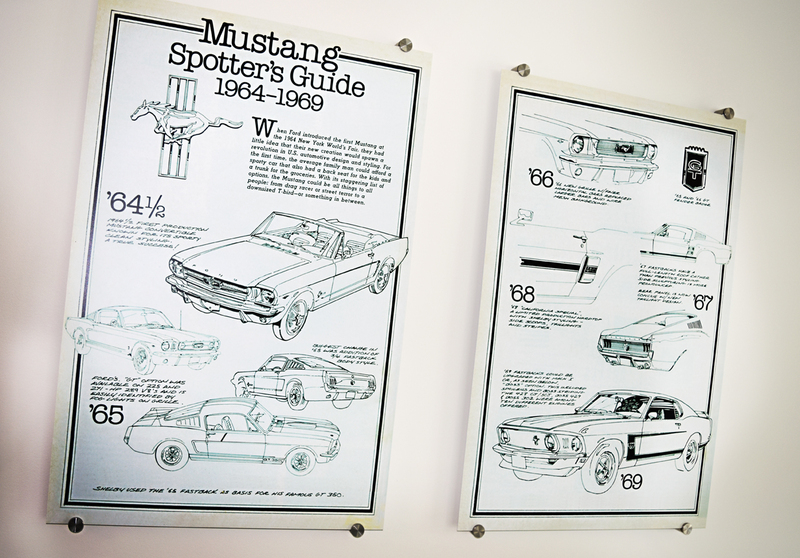 The Boss 302 Mustang was designed by Larry Shinoda, a former GM employee. The car featured a reflective ‘c-stripe’. The fake air scoops in the rear quarter panel fenders of the regular production 1969 Mustangs were eliminated on the Boss 302 models. 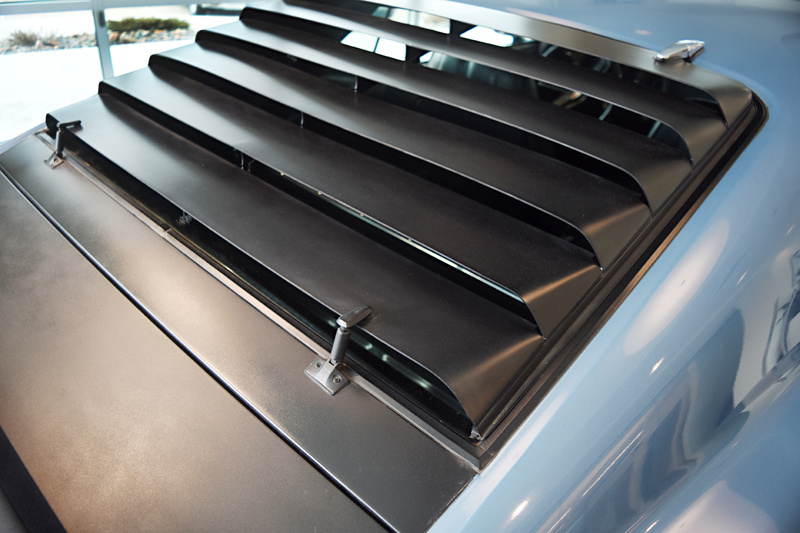 A black horizontal rear window shade and a blackout hood were both options. It was one of the first production models with a front spoiler and rear deck wing. The name ‘Boss’ came about when Shinoda was asked what project he was working on, he answered “the boss’s car” because the project was a secret. Shinoda eventually named the car the “Boss” as an homage to the new President of Ford, Semon ‘Bunkie’ Knudson, who had brought Shinoda over from GM’s Chevrolet Division after Knudson had left. 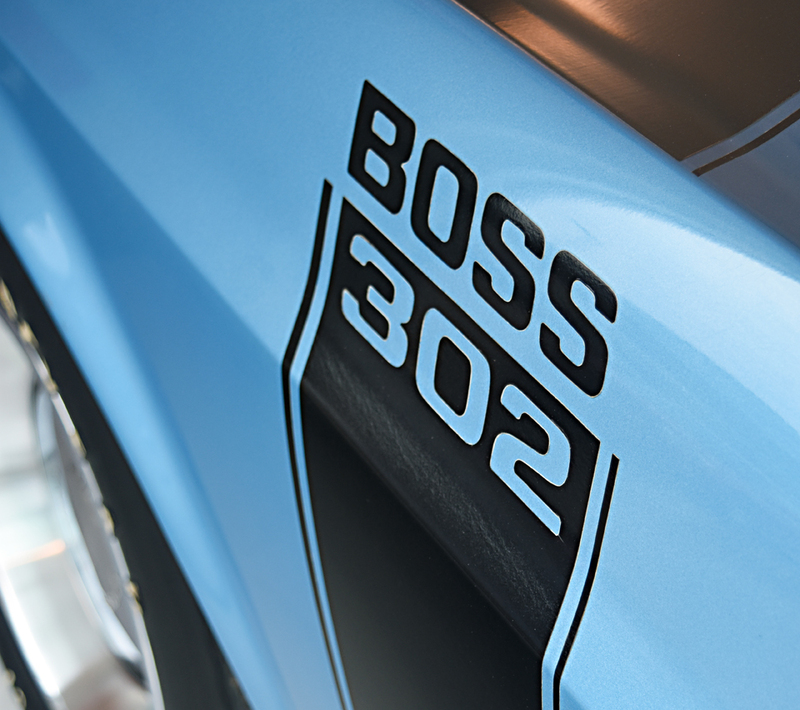 Changes to the 1969 model were kept at a minimum for the 1970 ‘Boss 302’. The 1970 version came with a scooped fender cap. This was perhaps the most visible change. Ford also added new vertical side markers along with the 1970 grille which replaced the four headlights with two vents in the outside position while retaining dual headlights within the grille opening. 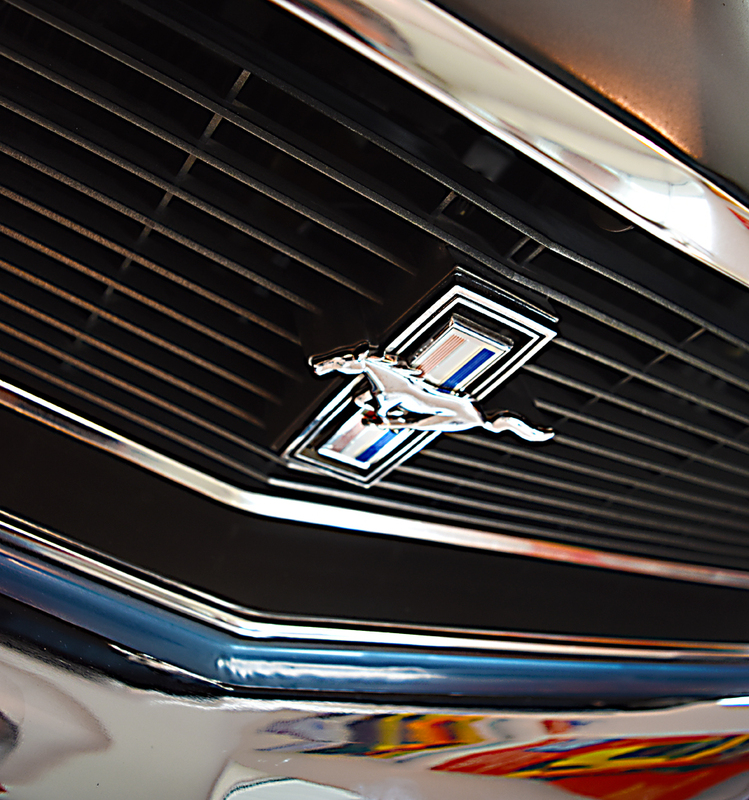 The dual exhaust system was redesigned and the standard wheels were upgraded to 500 Chrome Magnum wheels, whilst the Pony emblem was relocated to the center of the grille. The 1970 Boss 302 also had new unique black side stripes which started across the top of the hood. The headlights were moved to conform with the grille, and reduced to two rather than four. Functionally, the dual exhaust system was redesigned as well as the competition suspension and the 1970 model 302 now came with a Hurst shifter. The intake valves were smaller and the chrome was replaced with aluminium. Although Ford’s ‘Drag Pack’ option with a special oil cooler was never formally offered on the Boss 302, it was often included with the 4.30:1 rear axle ratio option. This coveted option is easily recognizable when the hood is opened to reveal Ford’s vertically mounted oil cooler in front of the radiator. Ford also had an option for Boss 302’s and 429’s for deluxe interior rather than standard interior. 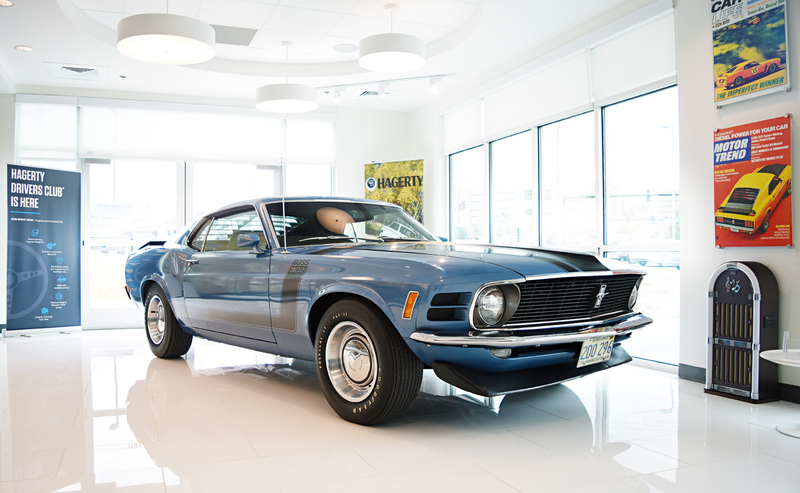 The stunning, all original, 16,000-mile and highly collectible ‘Medium Blue’ (There She Blue) Boss 302 we have on display at Hagerty in Golden this month has both the highly desirable ‘Drag Pack’ and rear end options as well as the deluxe interior. The car which is maintained by Gary Riley at Level One Restoration in Denver, is kindly on loan from owner and collector Wayne Schmeeckle.